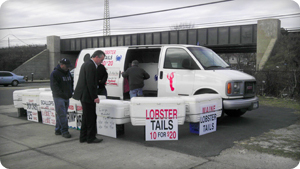 Back in 1997 father and son, Stewart and Jordan Brill, came up with a great idea to sell frozen seafood out of a van in coolers to the public on street corners throughout the 5 boroughs of New York City. We would buy from directly from importers so we could afford to give wholesale prices to the public. We used to sell only on weekends. During the week we would wholesale seafood to restaurants and other fish markets. Eventually we ended up selling right here on Long Island. As time went on, we eventually open a store to the public back in 2003, which we only sold fresh and frozen seafood. At Island Fish, we deal only with local fishermen. 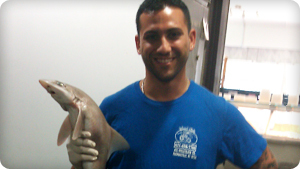 This way we can ensure that you’re going to get the freshest of seafood. We don’t just buy seafood to fill our showcase, we hand select our seafood every day because it looks appetizing. Whatever we don’t sell as, we prepare and cook it that same day. Because of our passion for food, we started to cook lunch and dinner meals as well. Island Fish was awarded by AOL for City's Best for Seafood on Long Island, 2008 & 2009. We cook all meals to order. If nothing grabs your attention from our menu, deli showcase or specials board, anything from the fresh fish showcase can be prepared and cooked any way you want. So Come On In....It's Off Da Hook!